The research project Creating Inspiration: how the visual and performing arts shape environmental behaviour was run through the Institute of Rural Futures at the University of New England. It was funded by Land and Water Australia and the Rural Industries Research and Development Corporation from 2002 to 2007. The project had several outputs, among them a PhD thesis (Curtis, 2007); a training manual on how to use the arts in environmental outreach; policy recommendations; major reports to both funding bodies (Reid et al., 2005; Curtis et al., 2007) and numerous articles on the findings of the research. The research examined eight case studies that combined the arts with environmental education, including concerts, art exhibitions, group-devised drama pieces, and community events. It included extensive interviewing with informants and people associated with the case studies as well as surveys of participants and audiences and in-depth testing. The research drew on sociology of the arts, environmental sociology, social geography, environmental education and extension, and sustainability science. Valuable evidence was collated to show that the arts have an important role in affecting values, beliefs, attitudes and social norms. They can also be used in reversing unsustainable habits, and in overcoming some of the physical constraints the prevent people to change their behaviour by helping to reshape urban design or by developing low carbon forms of consumption. The research concluded that there are three main pathways through which the arts can help shape behaviours that are more environmentally sustainable. The first pathway is by aiding communication in the education and extension contexts. The second pathway is by creating empathy for the natural environment. The third pathway is where the arts are integrated with measures to improve sustainability. 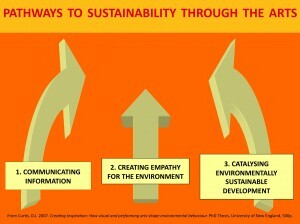 All three pathways are valuable in helping promote environmental sustainability. Arising from the research, 10 refereed papers and book chapters have been published and numerous other articles and conference papers. The research was the first major study examining the arts and environmental sustainability in Australia. It led directly to the formation of the non-government organisation EcoArts Australis Inc.
Policy recommendations from the Creating Inspiration research project, please click here. The report to Land and Water Australia, please click here. A list of articles from the Creating Inspiration research project, please click here.